STEALTH MODE: A lethal battle of wits plays out in the Sam Miller-directed film. Let the right one in. 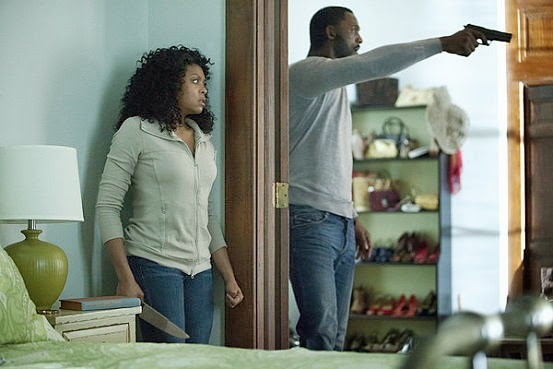 So learns the trusting and kind-hearted Terry (played to a tee by the talented Taraji P. Henson), the lonely and severely stressed housewife at the centre of No Good Deed, a meat-thin but occasionally jolting and suspenseful character study of human violence and survival instincts. The antagonistic character in question here is Colin Evans (Idris Elba), an on-the-lam career criminal and one of the most wanted men in the US state of Tennessee, whose long history of wreaking havoc is unspeakable. Unfortunately for Terry (a mother of two) whose house he happens to call upon in the dead of night asking for a phone call after crashing his stolen truck in heavy rain, he's also a disarming smooth-talker who can have a woman so dazzled she won't even notice her dress dropping to the floor. But as viewers will discover this middle-brow flick is no study in romantic seduction. At its best, the movie offers a thrilling chance to catch two of Black Hollywood's most magnetic stars at the top of their game, even when the film's narrative slips into shallow, lurid waters. While Elba brings the gravitas required to pull of the narcissistic cunning of the sociopathic Colin, Henson, whose filmography includes an Oscar-nominated turn in The Curious Case of Benjamin Button, shows she can keep pace, mustering a brutal force of her own without compromising her feminine allure. The roles of Colin and Terry are grit-ridden parts and feel ideally suited to these terrific actors, who, under Sam Miller's direction do their best to make something substantial of the otherwise derivative and a tad exploitative material they have to work with.